You are here: Home / Budgeting / How much should you have saved? 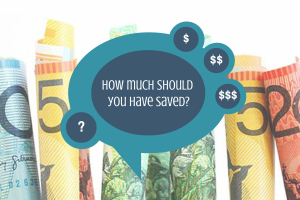 I am often asked how much should you have saved? Well isn’t that the million dollar question (pardon the pun!) But seriously, what is a minimum guide for how much money you should have saved for emergencies? There are a range of suggestions professionals make when guiding people on savings. Mostly these focus on how long your savings would last and they often seem like huge targets to achieve if you don’t have much in savings (or anything at all). So where do you start? These are some helpful tips that will let you build up your savings and set realistic goals that are motivating and achievable. Ok, so your bank account is at zero at the end of each week (and you probably also have credit card debt). If you read the advice of 3-6 months of expenses saved and laugh hysterically because it seems totally unachievable then start here. I get it, we’ve all been there. Let’s start small. I want you to set a goal to save the excess of your car insurance or the cost of replacing an essential household appliance (like your washing machine). It will probably be an amount of $500-1000 and it may take a while. That is ok. The important thing is that you keep it saved. Don’t spend it on everyday expenses. Lock it away in an online account you can’t easily access. There are plenty of families out there on good incomes that cover their expenses (and more) but that still don’t manage to save much. If this is your family then I have a challenge. Sit down and work out a super tight budget. I’m talking the minimum you can live on for a month or two. Now…here’s the challenging part. Stick to that budget for 6 weeks, at least. It probably isn’t a budget that you can keep indefinitely but if you go hard for just 6 weeks you will build a nice little savings balance. You may also surprise yourself with how easily you can cut back. Once the 6 weeks is up, don’t go crazy, modify your budget and work out a realistic and consistent saving target and then stick to it. Repeat this process every 4-6 months. After a year you should have at least a month worth of income saved plus you will have learnt some new habits to reduce your spending. Great post! We are often living beyond our means these days so it’s great to have this in real terms. We definitely don’t have that kind of money saved for emergencies. Thanks for sharing. I think it often seems so overwhelming people just don’t even bother but if you can work towards small goals it does make a difference! I’m aiming to save $10,000 before I stop worrying about adding to my emergency savings. I think that’s about 6 months of living expenses anywhere in America on a really bare bones budget. Right now I’ve got it up to about $2,500, which covers my health and car insurance deductibles. Great post and wonderful advice to start where you are in your financial journey and save something towards a goal! We have what we consider a “fully funded” emergency fund (for us). How we came up with the number is worse case scenario type of thinking… we own a house and some big “oh-no’s” run around $10K. We are also a military family and if the military all of a sudden moves us without much notice, we would need $8K-$12K. So we try to keep $15K in our emergency fund… so far we haven’t come across a situation where we’ve needed more (knock on wood), thank goodness! That is a great plan. Owning your home obviously changes everything! I’m based in Australia so things are a bit different here with costs etc, housing in particular is a huge expense with most families in capital cities having mortgages of 400,000- 500,000!! Even rent in any of the major cities is around $400-1000 a week depending on where you are so a huge chunk of take home income. Excellent post on a really important topic! I like your list — helps make the risks a little more real for your readers. We have enough in our emergency fund to allow one of us to be off work for 6 months before it would impact our retirement savings. I can’t overstate how much peace of mind that brings….. I think that is an ideal aim. You just never know what the future holds & having to stress about money if something horrible & unexpected was to happen is not what you need.